OCTOBER 26, 2017 – KENT, OHIO – Just in time for the 2017 holiday season, comes the next evolution in writing and a revolutionary new electronic writing tool – BlackboardTM by Boogie Board. 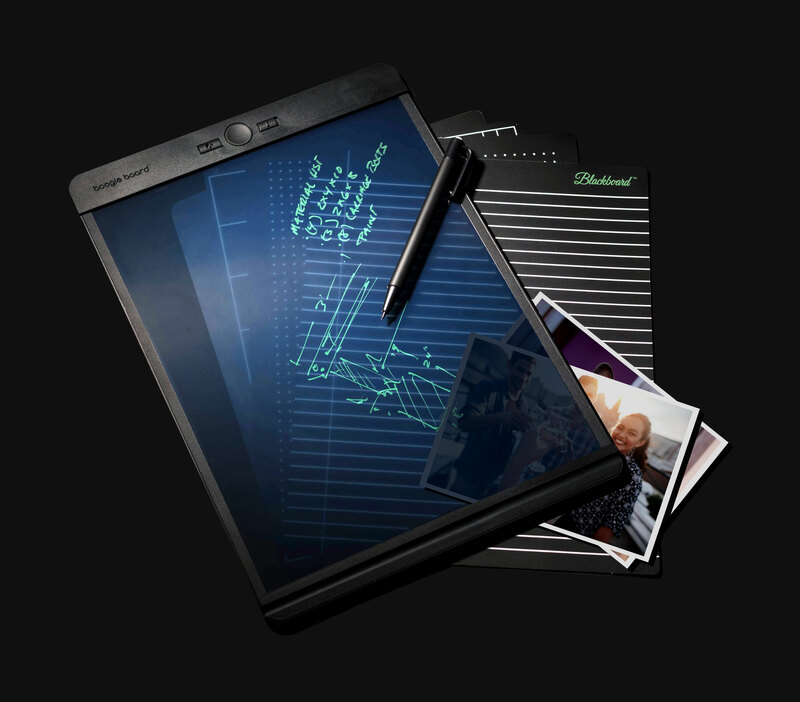 It’s the first-ever writing tool featuring Liquid Crystal PaperTM, offering a new way to plan, write and design by hand that somehow feels like nothing new at all. Blackboard hits store shelves at U.S. retailers nationwide in fall 2017. Boogie Board is the world’s leader in eWriters and like every Boogie Board before it, Blackboard writes and erases electronically using no ink or paper. 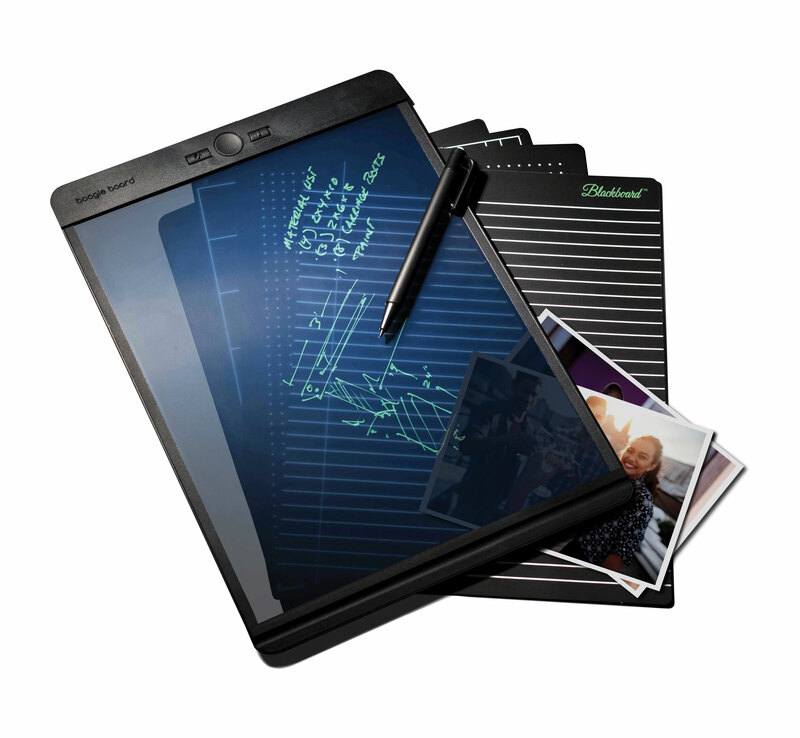 But the revolutionary new Blackboard adds a significant number of new innovations, including its proprietary Liquid Crystal Paper™ feature set which creates the most comfortable and natural paper-like writing experience yet. 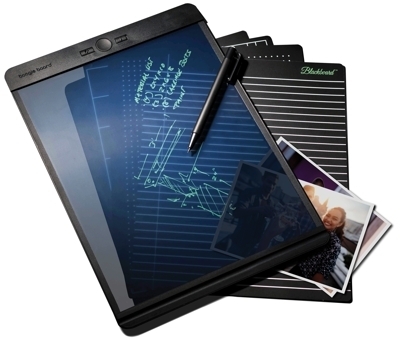 Unlike other electronic writing solutions offered by more expensive tablets and smart devices, Boogie Board’s technology writes with absolutely no lag or delay with nothing to turn on, plug in or charge – making Blackboard ideal for all writing activities like notes, lists, sketches and more. Perhaps its biggest breakthrough is its 8.5” x 11” Letter-sized, semi-transparent writing surface that allows writers to electronically write on any document, photo, map, or even digital screens – ideal for collaborative editing, designing floor plans, tracing, planning, and writing over templates. Several templates are included with Blackboard, including lines, grids and more. A single touch of its Clear button erases the entire writing surface, but now for the first time ever, Blackboard offers precise control for a pencil-like erasing experience using exact-eraseTM technology, allowing writers to erase just their mistakes while leaving their remaining work in tact. For work that needs saved, the free Blackboard mobile app allows writers to capture, save, organize, search and share. "With Blackboard, we've arrived at an incredible cross-section where high technology allows us to create a back-to-basics experience that somehow feels revolutionary and familiar at the same time," says Hunter Morris, Blackboard’s Director of Product Design. "Quite ironically, we've developed a breakthrough tech product that resides so naturally in the stationery aisle. It's inkless pen on paperless paper – without the inconvenience of chargers, plugs or ports," Morris said. What is Liquid Crystal Paper? 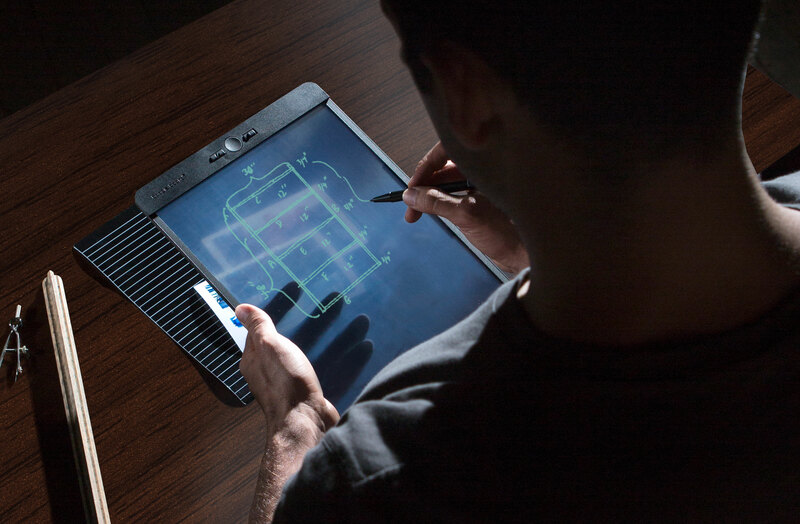 Blackboard is the first ever writing tool to hit the market using Liquid Crystal Paper, is a pixel-less, non-digital technology that writes and erases electronically, but feels incredibly natural with no lag or delay. It works on the principle of anisotropic flow, a unique feature of cholesteric liquid crystals, in which crystals flow at different rates, depending on the direction of pressure being applied. Blackboard will be available online or at major retailers including Staples, Office Max, Office Depot, Barnes and Noble, and Fred Meyer in fall 2017 with a $44.99 MSRP. Blackboard is a new product line and sub-brand under Boogie Board, manufactured by Kent Displays, Inc. Founded in 1993, Kent Displays has transitioned from a research-focused licensing organization into a consumer products company and is the worldwide leader in the research, development, and manufacture of patented roll-to-roll no power LCDs. The company is a global leader in eWriter display technology and the maker of Boogie Board brand eWriters – among the world’s fastest-growing communication and writing tools. Hailed for its incredibly natural writing experience, Kent Displays has sold millions of Boogie Board eWriters in 40 countries worldwide. Kent Displays has won numerous global and North American business awards for manufacturing, business growth, and innovation, including the Toy Industry Association’s coveted Toy of the Year award in 2016. Kent Displays has approximately 100 associates, with locations throughout the world. A limited number of Blackboard review samples are available upon request.